Aluminum foil is a big help when roasting a turkey. 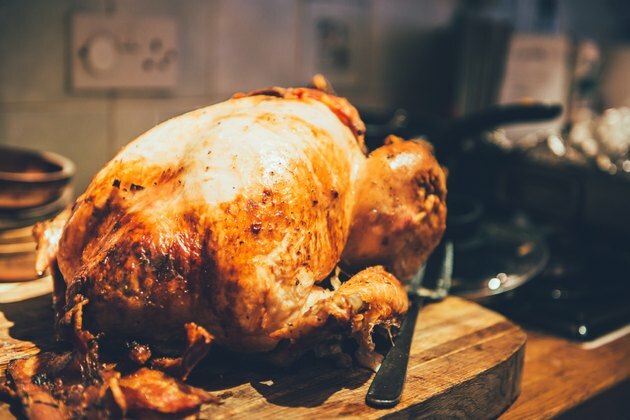 Use aluminum foil in one of two ways: enclose the turkey in the foil before roasting it in a hot oven; or, use the foil as a tent to control the level of browning. Enclosing the turkey makes it cook faster, but the turkey skin, though golden, isn't crispy. The tent method yields perfectly crispy skin and a slow-roasted flavor, but it takes more time. Tear off a piece of aluminum foil that is three times longer than the length of the turkey. Lay it over the roasting pan, centered lengthwise. Lay the turkey on the aluminum foil breast-side up. Brush the turkey with melted butter or vegetable oil. Bring the sides of the aluminum foil up along the sides of the turkey. Bring the ends of the foil up over the top of the turkey. Overlap the ends of the foil so that they will stay in place, but don't seal them so they are airtight. Put the turkey in the oven. Roast the turkey until a thermometer inserted in the thickest part of the thigh reads 180 to 185 degrees Fahrenheit. Allow roughly one-and-a-half hours for an 8-lb. turkey and an additional eight to 10 minutes for every lb. over 8. Place the turkey in the roasting pan breast-side up. Brush the turkey with oil or melted butter. Make a tent from the foil by creasing a piece of foil in the center. Prop it up over the turkey. The ends will be in the roasting pan. Stand the center up 1 inch over the turkey breast to allow for air flow. Put the turkey in the oven. Roast it until a thermometer inserted in the thickest part of the thigh reads 180 to 185 degrees Fahrenheit. Allow 25 minutes per lb. for an unstuffed turkey, and 35 minutes per lb. if it is stuffed. Another way of tenting the turkey involves roasting it without the aluminum foil for the first two-thirds of the time. At the two-thirds point, lay a piece of foil loosely over the turkey to keep the breast from browning further while the thigh meat continues to heat to the desired temperature. Turkey won't brown well if it is covered with aluminum foil. If your turkey is looking a little pale for your taste, remove or fold back the foil for the last 30 minutes of roasting. To season your turkey, place fresh herbs, onions, garlic, or peppers in the cavity before roasting it. If you are using the enclosed method, don't stuff your turkey. The faster-cooking times don't allow the stuffing to heat quickly enough to kill food-borne bacteria in the stuffing. If you are tenting the turkey, you can stuff it. Cook the turkey until the stuffing is 165 degrees Fahrenheit.